In addition to designing sound for this production, I also had the pleasure of designing the projections and video. The production called for several live video streams, an offstage set that was setup with a camera for an onstage FaceTime Call, as well as large amount of video content. To accomplish the live video, we created a dedicated video network that our primary machine (a very robust iMac) would hardline into. Then we had 4 different cell phones on the network (2 for live video streams and two for phone rings/texts via StageCaller). In addition to the wireless rigs, we also had a studio camera setup in the basement of the theater to for the FaceTime call. All of this content went out to 2 television screens that were mounted into the set. Throughout the course of the play, we would see premonitions of the future: mugshots of the characters. In order to sync up video and sound, we networked both the video computer and the sound computer together and ran OSC commands from one to the other to trigger. While primarily used for sound, the other iMac was also used to run a single projection cue early in the show. Pretty early in the show, several of the characters are the victim of a hate crime. Cotton balls are dropped on the floor of their dorm building with signs that read “Cotton Picker.” For this moment, there was a drop rigged above the stage that dropped tons of cotton balls and signs. When this happened, there was a projection that also washed the stage in cotton balls. 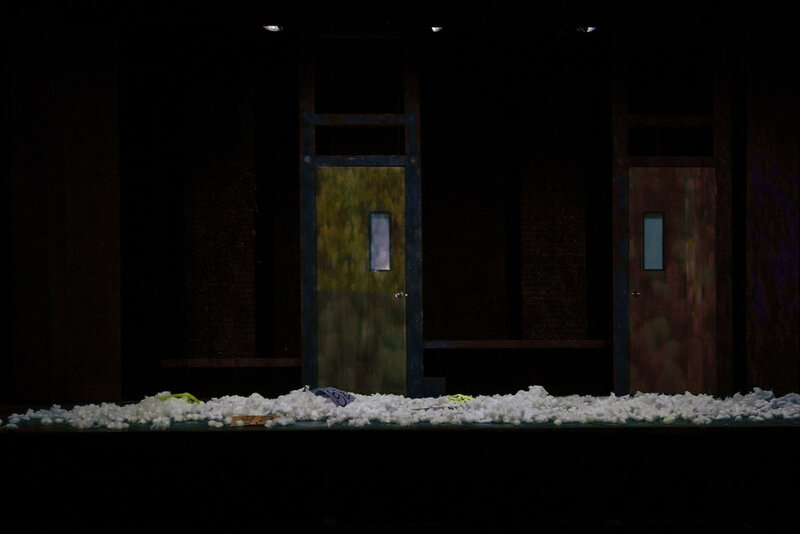 As the onstage door units tracked from side to side during this transition, they would pick up the image of the cotton balls: further implying that scale of the hate crime.